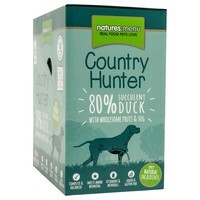 Natures Menu Country Hunter Dog Food (Succulent Duck) is a complete and nutritionally balanced meal packed with a single source of protein, and delicious fruit and vegetables. Made with 80% human grade Duck plus wholesome fruit and vegetables, Country Hunter Pouches are filled with only top quality raw ingredients that have been sealed and then steam cooked to lock in goodness. Containing no nasty meat meals or derivatives, artificial colours or flavourings, the pouches are a great alternative to raw feeding when travelling or staying away.